Regiment/Catrawd: 13th Battalion Cheshire Regiment. Service Rank and Number / Rheng gwasanaeth a rhif: Private No. 52052. Military Cemetery/Memorial / Fynwent milwrol: Regina Trench Cemetery, Grandcourt, Somme. Ref No Grave or Memorial / Rhif cyfeirnod bedd: Plot: V1. Row: F. Grave: 15. Killed in action on Saturday 21 October 1916, aged 33. Henry Hope Davies was born in Rhyl, Flintshire during 1882. The 1901 Census shows that the family lived at 4 Aquarium Street, Rhyl, Flintshire. The head of the family was Robert Davies aged 55, who was employed as a Bricklayer. His wife Martha Davies aged 56 and their 5 (five) children – John Hope Davies aged 28, a Clerk, Thomas Hope Davies aged 20, a Bricklayer, Henry Hope Davies aged 19, a Drapers Assistant and Letitia Hope Davies aged 16 years. During early 1906, Henry obtained employment as a Gentleman’s Outfitter in London. He lived at 33 Godolphin Road, Shepherds Bush, London. On Thursday 9 December 1915, he enlisted as Private No 35484 Royal Welsh Fusiliers at Hammersmith, London. His Attestation Certificate (British Army WW1 Service Record can be viewed on ancestry.co.uk). On enlistment he was described as 5’5″ tall, Chest Measurement 33″, Expansion 3″. His physical development was described as good and according to the Recruitment Officer and Medical Officer he was fit for Military Service. Private 52052 Henry Hope Davies. On Thursday 6 July 1916, he sailed for France and on Monday 4 September 1916 transferred to the Cheshire Regiment. He was killed in action just over a month later at the Battle of the Somme. Cymru Newspaper – Friday 17 November 1916. Private Henry Hope Davies, Royal Welsh Fusiliers (Attached to the Cheshire Regiment), brother of Mr E Hope Davies. A Traveller with Messrs Vallance and Company, has been killed in the Somme Battle. On 1 March 1917 a payment of £1.14s.1d was made by the War Office to Mrs Martha Hope Davies, this being monies owed to her son Henry. On 10 October 1919, a further payment which is recorded as a War Gratuity of £3.0s.0d was also made to her. 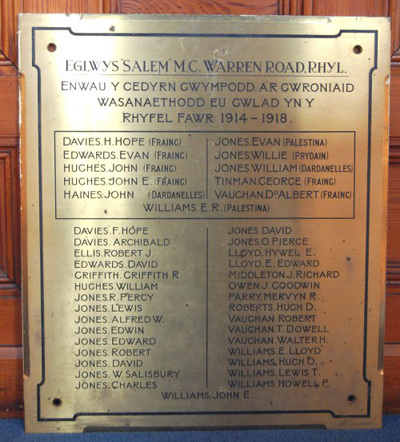 Private Henry Hope Davies is also remembered on a Roll of Honour Plaque at the Welsh Methodist Chapel, Warren Road, Rhyl, Flintshire. Many thanks to RWF researcher Darryl Porrino for sharing this letter with us. There is a Flintshire Roll of Honour Card for Henry Hope Davies at the County Archives Office, Hawarden which is dated 10 September 1919 and signed Mr R Lowe.